Arrival in Luang Prabang, the ancient wonderfull capital of Laos, World Heritage Site by UNESCO since 1995. Welcome by your local guide and transfer to hotel. Visit the Monastery of WAT Xiengthong, WAT VISUNNARATH, WAT MAI, and WAT SENE. Free time for a small shopping at the night market. Rising early to see the procession of alms to the monks. Visit the fresh market. Continuation of the tour with the National Museum (former Royal Palace) built in 1904, is a blend of traditional Lao and French classical style. Visit Ban Phanom (weaving village), the village of Ban Sang Khong (papermaking) and the tomb of Henri Mouhot. Minibus ride to the amazing falls of Kwangsi (you can enjoy a bath on the blue and natural water of the falls). Trip on a traditional tail boat upstream of the Mekong to the PAK OU cave. Visit of the cave which housing 4000 ancient statues of Buddha. Lunch in a restaurant in Ban Pak Ou. Visit Ban Sang Hai village specialized in distilling Lao whiskey (Lao Lao). In the end of the day, walk to Mount PHOUSY to watch the sunset over the Mekong and the view of the city of Luang Prabang. Free time until the transfer to airport. Breakfast is included in delivery. Prices for trips vary depending on the type of accommodation chosen and the number of participants (more than you are, the more the price will be low). 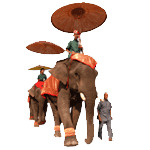 As a guidance, the price for this Laos tour is $ 287, based on 4 people in standard accommodations.